Home > Eye Treatments > What is Ozurdex? Retinal eye diseases such as age related macular degeneration, diabetic retinopathy and retinal vein occlusion are difficult to treat. All of them have different causes and progress in different ways but share a common theme – they all cause the tissues within the retina to swell. This excess fluid builds up and causes swelling, referred to medically as oedema. It damages the delicate tissues of the retina, causing the layers to become disrupted and tearing apart the nerve connections between the photoreceptor cells and the nerves that carry signals to the eye. A little bit of swelling in the macular – the central point in the retinal responsible for our finest vision – can have devastating effects. Blurring of the vision is an early sign but progression to loss of vision in the central visual field can happen very quickly as macular oedema develops and worsens. These are few and far between and do not help in all cases. Commonly used is laser photocoagulation therapy – this involves burning spots within the retina to seal up the leakages. It is a damaging treatment in itself but it does seem to slow the process of retinal disease and helps to protects people’s sight from disappearing completely. The only other treatment that is approved is a vitrectomy – when the cloudy gel from inside the eye ball is removed to clear the vision. The lack of treatments has led to the development of several new therapies in the last decade, and these are now in late stage clinical trials and could be approved for use soon. One of them, Ozurdex, is approved for the treatment of retinal vein occlusion and could soon be approved in the UK, Europe and the US, for diabetic retinopathy. Ozurdex is a tiny implant that is inserted into the eyeball using a special applicator. This makes a tiny cut in the white of the eye, at the side, just large enough to get the implant inside. It is fully biodegradable and has a slow-release mechanism so that the active drug – a steroid – can act directly on the retina for a period of several months. Other steroid injections into the eye have been tried but these have to be done once a month to have a consistent effect. As each injection carries some risk of infection and damage to the eye, reducing the number of procedures is a distinct advantage. Ozurdex needs to be replaced only about 3 times a year, which is a lot safer than 12 injections during that time. The steroid within the Ozurdex implant is called dexamethasone. This steroid is much safer when used inside the eye compared to other steroids – these can cause the pressure in the eyeball to rise over time, which can lead to glaucoma. Ozurdex was approved to treat the macular oedema that tends to develop after one of the retinal veins has been blocked by a blood clot or a fatty plaque. This can happen in people with generalised atherosclerosis; the blockage of the retinal vein makes it difficult for blood carrying carbon dioxide and other waste to exit from the retina – this causes bleeding and tissue damage. 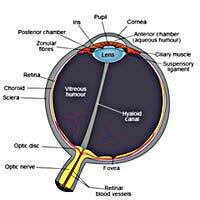 The normal body response is inflammation and the retinal swells in an attempt to curb the damage. This, unfortunately, has the opposite effect and actually makes things worse. Clinical trials have shown that people with retinal vein occlusion and macular oedema have significantly less loss of sight if they are treated with Ozurdex, compared to either placebo injections or laser treatment. The clinical trials in patients with diabetes who experience retinal damage due to their irregular blood sugar levels over many years also show good results with Ozurdex. After the approval of Ozurdex for the macular oedema that accompanies retinal vein occlusion, this has shown that the implant is effect for treating retinal swelling. There is now a good chance that this treatment will also become available for other retinal diseases but this will depend on the review of the trial evidence by the Food and Drug Adminstration in the USA and the European Medicines Agency. They recently decided to approve Ozurdex for a second eye disease – uveitis – in which the eye becomes very inflamed and approval for its use in diabetic retinopathy could come in 2011.